I love garage sales! I love getting rid of old stuff and I love making some extra pocket money. My Mom and I held one last weekend, and I don't even know what we sold, but we made like $800! Now 2 spaces in her 3 car garage can be used for actual cars! She is pretty stoked, lol. Holding a garage sale is a bunch of work, and you have to deal with some characters. Here are some of the people we met at our garage sale. These people are ruthless. They arrive the minute your garage door opens, no need to wait for the set up. They quickly buy all of your 'good stuff' and try to drive down the price as much as they can. I have a feeling they are just collecting inventory for their booth at the flea market. Once it was a dude who bought every pair of shoes we were selling, another time it was a lady who bought every pair of jeans we were selling. I am not super eager to barter with these people, I feel taken advantage of when they leave. Typically involved in construction. They usually buy up cheap kitchen appliances and any men's clothing that would maybe pass as construction worker wear, and coats. They are usually friendly and rarely try to talk you down on the price. Sometimes you may have to make change for a $100 bill. No biggie. Would you like that in quarters? Now I don't know for sure if potheads are garage sale shoppers as a generalization, but we had 2 confirmed. See, my late step-father was in the business of selling things to convenience stores, so we have some suuuuper random leftovers in our garage. Those little bags that fit a can of beer, these lighter 'leashes' that you clip a lighter onto your belt with, and misc other things. There were 2 boxes of cigarette rolling papers, that anyone under the age of 60 uses for things other than cigarettes. One PH bought a whole box of these papers along with a paperback copy of Dracula and a Bill Deutrerive (from King of the Hill) plastic figurine. The second box of these sold was to a young man and woman who also bought all of my brothers old Power Rangers VHSs. Yeah, I profiled them, but I bet I'm right. lol. 5. The Super Specific Shopper. They come up to you and personally ask if you have the 1 item they are looking for. Old Coins, a baby gate, old records, children's clothing. It comes in all forms. I feel that if you are looking for something so specific, a garage sale hunt is sort of a waste of time. That is what craigslist is for. Unless you just enjoy going to look around, but these people didn't seem to. They slowly drive past your sale, decided from the street that nothing seemed worthwhile to stop, and drive on. I mean, you're already here, you may as well get out and look? They came up in their jalopy, looking like garage sales are the only place they shop. These people break my heart, and I sell them everything for 10 cents. These people are kind of the worst. I know you want a deal, but c'mon. The stuff is already cheap enough, and cheaper than the good will. But you say 50 cents, they want to know if you will take a quarter. With EVERYTHING. Or you say, this old suitcase is $3. Then they show you the scuff marks on the bottom, like they deserve a deeper discount. Pu-Lease. This stuff isn't new, for crying out loud!! Then they drive off in their BMW with all my stuff they paid a dollar for. I'd almost rather give it away. You have to watch these tricksters. This one dude asked my mom how much this random glass was, and I saw her tell him 25 cents, then he comes up to me to tell me she said 10 cents, drops a dime in my hand and walks off with that glass AND a book he did not pay for. Then he came back later in the day! Watch your money bag! Be weary of people trying to confuse you while you make change. Con artists are everywhere, man. Be on guard. These are the best. You meet your neighbors, get to know new ones. It is a nice little sense of community when you get to know who you share your neighborhood with. They buy some things that you will later buy from their garage sale. It is like the circle of life. PS. Send some prayers, happy thoughts or whathaveyou to me at 1pm today, I have a job interview at my friend's company!!! OMFG! You are spot on! 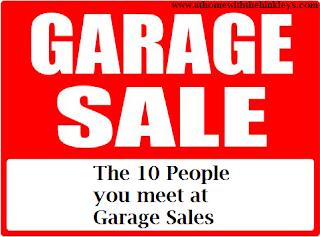 I go to garage sales all the time, I promise I am not any of these people. I usually pay asking price unless I think it is absolutely ridiculous than I just walk away. (Like selling a freaking Louis Vuitton purse for $300 at a garage sale. Psh! Put that shiz on Craigslist or something) But I see these people all the time! And I can't stand when I have a garage sale and people just drive by, so I make it a point to get out and look if I am already there. But seriously, this is spot on, haha! Nice post! I love yard sales!